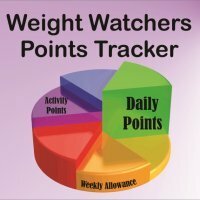 This Weight Watchers Points tracker is a spreadsheet you can use offline to track the points in the foods you eat to stay within your daily and weekly allowance. If you are a member and trying to lose weight, then keeping track of what you eat is critical to reaching your goals. While there is online tracking through WW e-tools, sometimes having your own file is just easier. If this sounds like you, then check out the spreadsheet to track your points. This one file will work for the new Smart Points, Points Plus and even the original Points System. So no matter what you are following, you can track your numbers. There are two files you can download to your computer. You can pick one or both, depending on your needs and how you want to track your Smart points, Points Plus or original Points. Both files will work for all the methods. So it does not matter which weight loss plan you are following, tracking will be easier with these files. While this works for SmartPoints, it doesn't have the new rules of the FreeStyle carry over points. You can now carry over 4 points each day. So if you are free stylin on your plan, then try this FreeStyle Points Tracker spreadsheet instead. You can save this file to your computer and then start tracking what you eat. It will automatically calculate your remaining daily allowance as well as your weekly allowance. In addition, you can plug in your activity points (FitPoints on the new plan) to track and use those as well. If you are just looking for a file you can print out, then the daily tracker PDF file might be what you need. Just right click on the links below and select "save as" to save to your computer. Scroll down to read more about each of these files. This file is a simple one page PDF file to be used daily. Each day you would print off the file and then start writing in what you eat to track. There is no interactive calculations. You must provide all the details and do the math yourself to total up the points for the day. While this is not interactive, you won't need a computer to use it each day (other than to print it off). So it's a great way to track your points while away from home. Keep it in your purse, pocket or even at your desk at work. To download this file, just right click on the link below and select "save as" to save it to your computer. Updated: The spreadsheet is now updated to include a calculator for the Smart Points. So no matter which system you are following, this spreadsheet has it all. The spreadsheet was created using Microsoft Excel. However, you can use a free software that is just like Excel called Openoffice. If you don't have a spreadsheet software, then check it out here and get your OpenOffice software to use this file. If you have Excel, this file will work with your program. Once you have unzipped the file, simply open it in Excel and start entering your information. You can reset it each week or save the file under a different name for each new week. 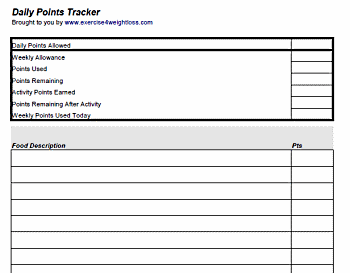 This spreadsheet version of the Weight Watchers Points tracker is interactive. Once you have provided your daily and weekly allowance, then the spreadsheet will track your progress as you input new food items. Because it is interactive and will do the calculations for you, you will always know how many daily or weekly points you have left. This file has 2 tabs (sheets). The first is the instructions on how to use the file. The second sheet is the actual tracker. Find your favorite restaurant and check out how many points are in the foods you order. The restaurant pages show the points plus, original points and nutrition information. Use this spreadsheet to track your exercise routines and how many calories you burn with your workout.